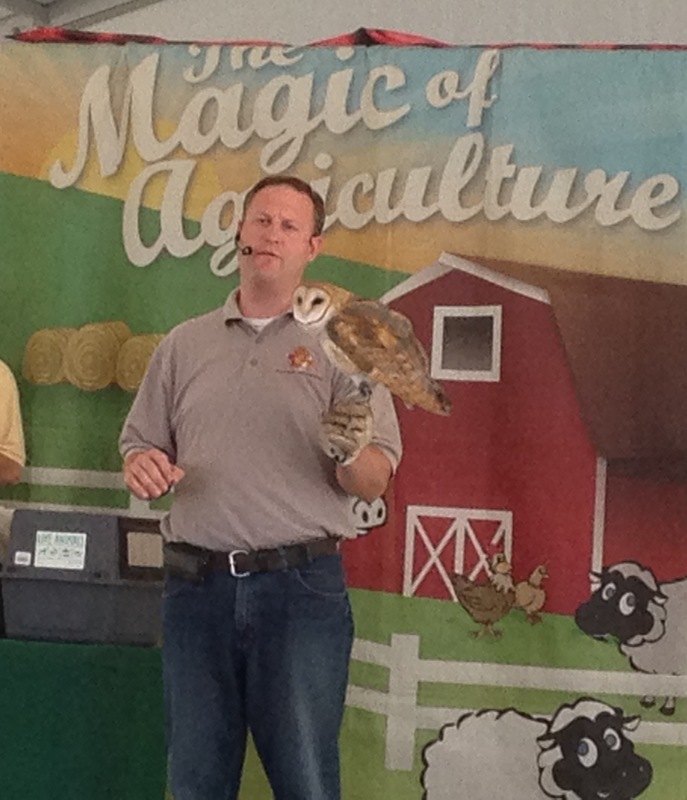 On Friday, August 16, we went to the Montgomery County Agricultural Fair and had a great time. We arrived a little late for the Birds of Prey show. 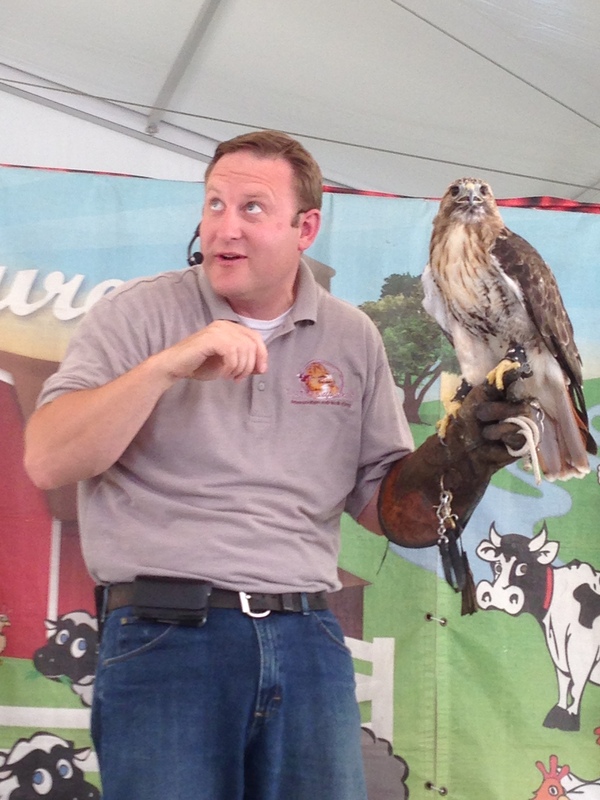 The raptor guy, Jason Caldwell, was talking about a hawk he held, I think a mixed breed. 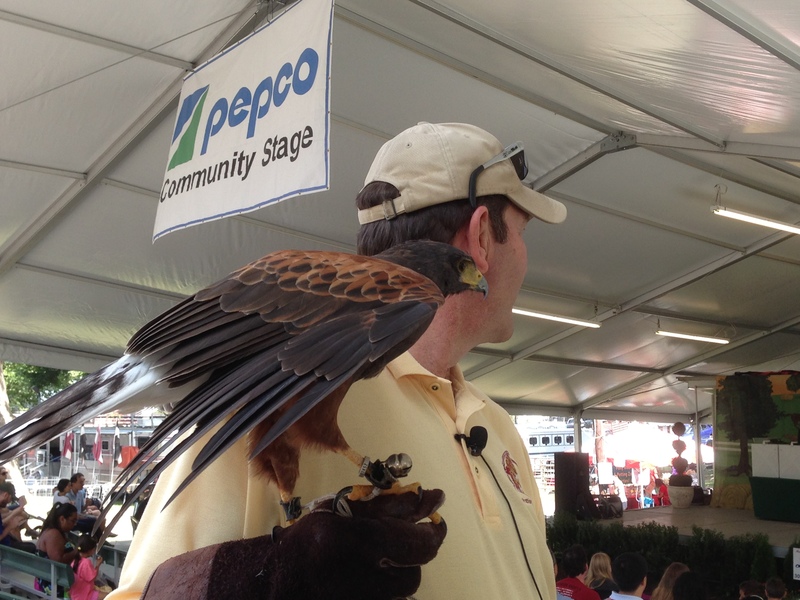 But at the back of the crowd as we approached was another man holding a hawk. It was dark brown with chestnut shoulder patches. Its white-tipped tail had a broad black stripe but was a bit ratty-looking from molt or agitation. “That’s not a Harris’s hawk, is it?” I whispered to him. He turned and smiled. “Yes, it is a Harris’s hawk.” I felt pretty good, considering the last one I saw was in 1996 in Tucson with Lou. 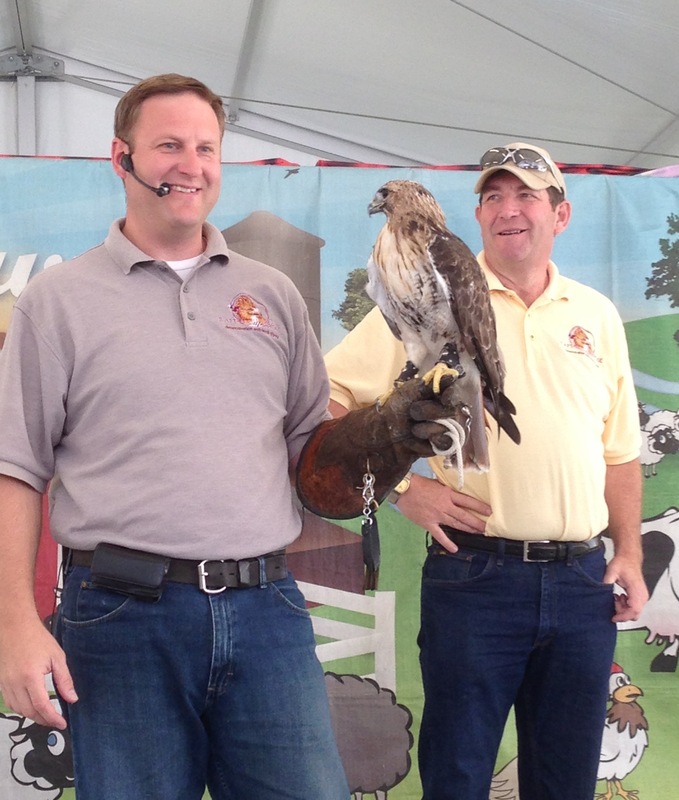 The man, Howard Caldwell (Jason’s father) and his Harris’s hawk, whose name was Magic, were next on the stage. Jason Caldwell holds a Barn Owl. Then followed a series of owls, as the two Caldwells explained plumages, behavior, and attributes. First was a lovely barn owl named Twilight, the only one I photographed as they were talking. 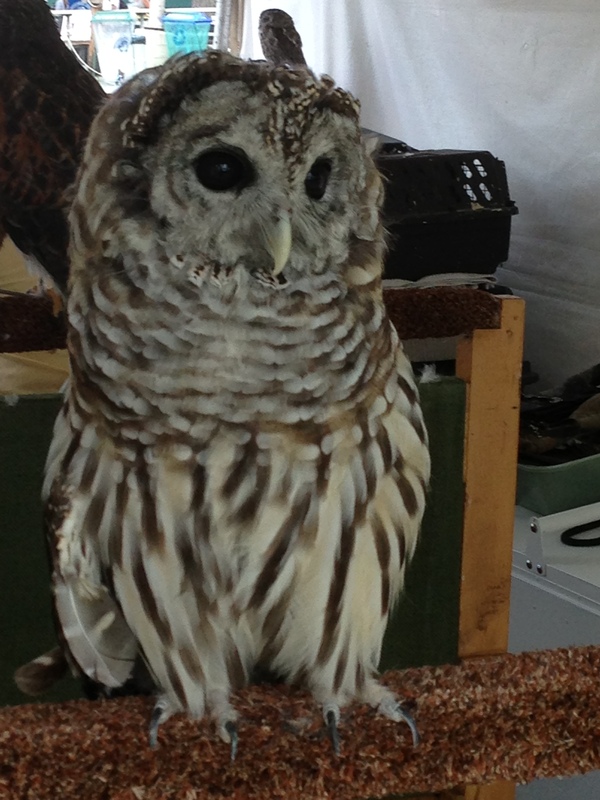 The barred owl, Anastasia, was just growing back some molted head feathers. I wished she would call–she has my favorite owl voice. “Who cooks for you?” she would ask. Smallest was Gabriel, a little male red-phase screech owl. Biggest was a powerful great horned owl, Artie, who sports a talon-closure pressure of 500 pounds per square inch. The last bird they discussed was a red-tailed hawk, a grande dame of 22 years named Majesty. Later, we went by their booth and I tried to talk them into teaching Birds of Prey in the Natural History Field Studies program. Because they live in West Virginia and are already very busy with presentations like this one and in avian abatement programs, Jason had to say it was very unlikely. What’s avian abatement? For example, if you are having a problem with a huge flock of starlings that are eating all the supplementary feed you put out for your flock of sheep, you call the Caldwells. They come out with a hunting hawk, the bird flies around a bit, and the starlings go elsewhere. Pretty neat. Funnel cake has no calories, right? We had beef BBQ for lunch (pretty good!) and then went and watched a beekeeper for a while. 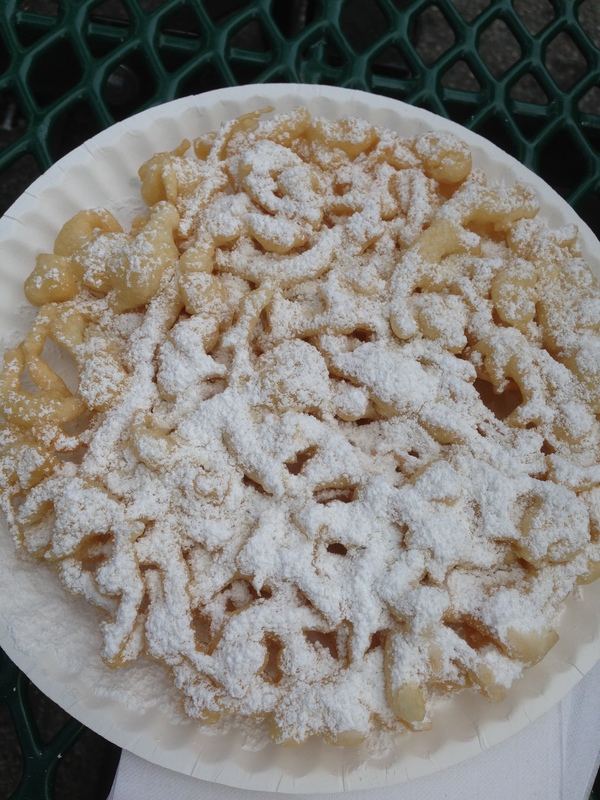 Wandered around among animal barns and then shared a funnel cake–yum! First one in a couple of years. After that, we strolled through some more barns, with pigs and piglets and sheep and sheeplets—oops, I mean lambs. That was fun. 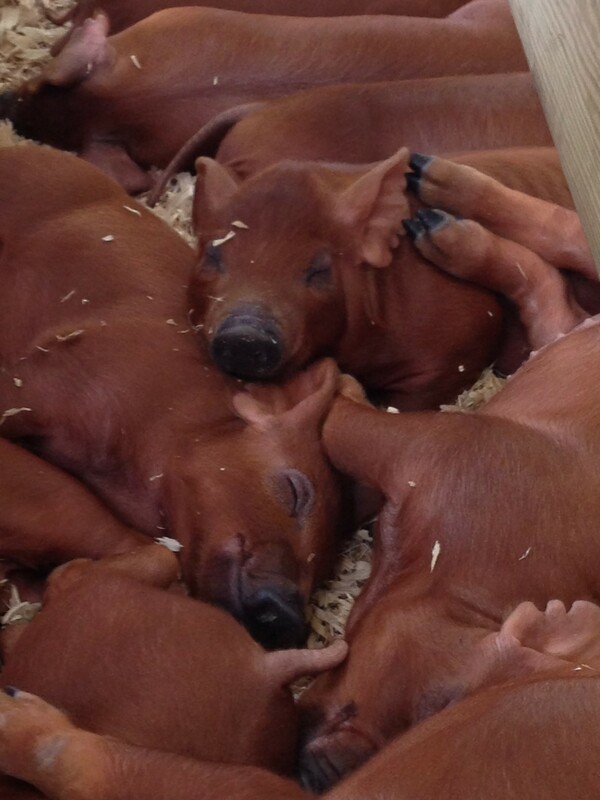 Loved the pile of baby pigs all sound asleep with their mother snorting and grunting nearby. Loved the teenaged Wilbur-pink pigs with their curly tails. 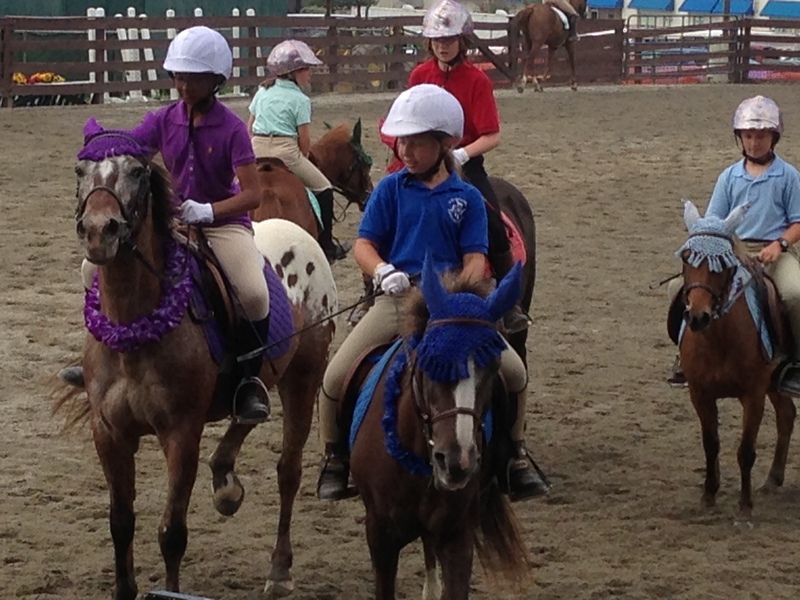 At the Arena, we watched some young equestrians put on a show of precision riding, and then their older cohorts in a real “drill team” presentation. That was fun, too. 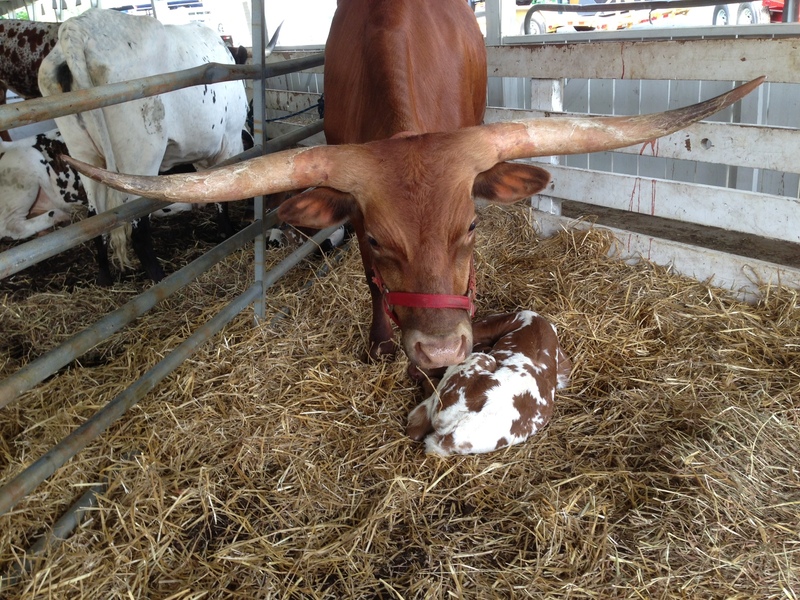 On our way back from that, I said, “I want to see those longhorns up close,” so we went into the barn for the Texas longhorns. Wow. Majorly impressive. A very new little calf was being nuzzled and licked by her mama, and watched by the family’s teenaged owner. The calf was born that morning and was only about six hours old. More desultory looking around. Admired the award-winning photos, drawings, and crafts; mourned the flower arrangements, now sadly disheveled and droopy, not to say dead; and bought some alfalfa honey to take home. 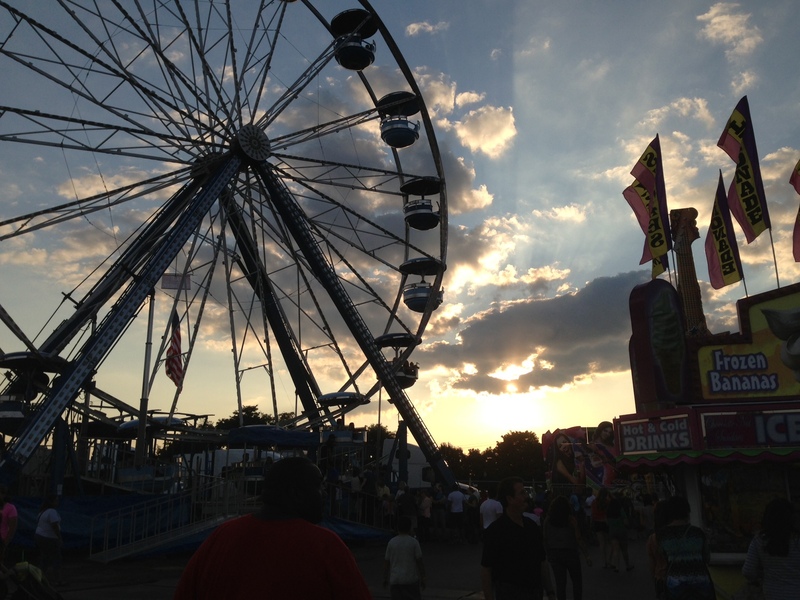 The Montgomery County Agricultural Fair at sunset. We had another snack while we waited for the bluegrass concert, but when the time came, we found it had been canceled, so “Let’s go home,” said Lou. So we walked down the hill through the bustling, noisy, colorful carnival area to the exit gate and said goodbye to the Fair for this year. Hurray for a great annual tradition, and hurray for no longer feeling obligated to ride on any carnival rides more stomach-churning than a merry-go-round!